Writing about our experiences in this blog helps fulfill the Third Goal of the Peace Corps which is to help Americans understand the people and cultures of Botswana. Before Tish and I applied for the Peace Corps neither of us had ever published a blog and I suspect many of you have never published one either. Many people DO publish blogs though. In fact, according to Wikipedia, “As of 16 February 2011, there were over 156 million public blogs in existence.” 156,000,000! Many of the those millions of blogs are, like ours, intended for friends and family to share an adventure. Some are commercial. Based on number of “hits” the most popular blog is Huffington Post. According to a web sites that give stats on the most popular blogs, Huffington Post is in the top position and has 54,000,000 visitors per month, and from their ad revenue they bring in over $2,000,000 per month. In fact the owner recently sold her site for over 300 million dollars. We are not in that league obviously and don’t make any money from our web site… I wish. I thought some of our readers might be interested in knowing who, beside them, are reading our web site. We have some statistics available on our blog from Google Analytics. This is a free service offered by Google to keep detailed statistics about visitors to the website. Out of curiosity, I started using Google Analytics on August 1, 2011 — just over a year ago. 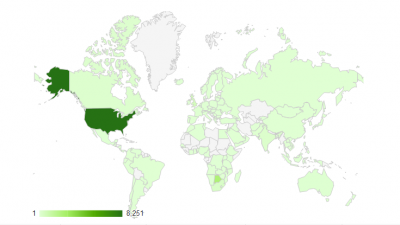 In this post, since we now have over a full year of statistics, I will share some of the information with you, in case you may be curious about who else visits our blog. The statistics surprised me. We have had many more visitors than I ever would have imagined. In addition to the friends and family who read the blog because they know us personally, there are people from all over the world who have never met us, who checked our site out at one time or another. Some find the blog because they did a google search about a topic that was mentioned in one of our posts. Also, a lot of Peace Corps applicants read blogs like ours as they prepare for service. They want to know what it is like in Botswana, what to pack, how our application timeline compares to their experience, what did we put in our essays, etc. So here are the statistics on visitors to our site for a one year period, August 1, 2011 through July 31, 2012. This entry was posted in Peace Corps, Service - Year 2 and tagged Blogging, Botswana, Mobley, Peace Corps. Bookmark the permalink. Thanks again for your good info. I will miss your blog when you leave the Peace Corps. Maybe you could keep it going when you leave.